Now that the "en Plein Air" paintings (paintings done on site) are finished, it's time to begin some paintings from the over 800 photos I took while in Hawaii. That's a lot of photos! So there are enough to use as reference for the remaining 88 paintings in this collection. If you've seen my Hawaii video, you may remember seeing a photo of these beautiful plumeria flowers. These are the flowers that Hawaiians use to make lei, the garlands placed around the necks of visitors to welcome them. I noticed that statues of local heroes were also adorned with lei during festivals. 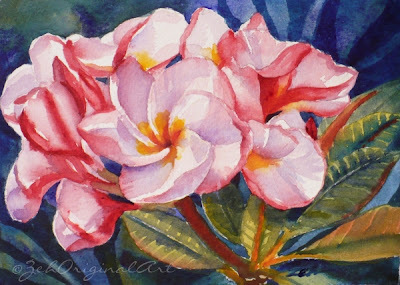 Plumeria flowers bloom on small trees or shrubs. They are gorgeous in full flower.